The course lectures are every Friday at 2:00pm Eastern Time starting Friday, February 10, 2012. The lectures will be using GoToWebinar to deliver a screencast and audio to your computer. 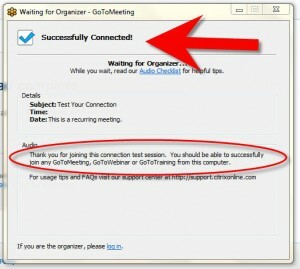 It is a good idea to test out the GoToWebinar connection. It is a GOOD IDEA to do this BEFORE the class starts. If you have technical difficulties with the test or on the day of the webinar, contact our webconferencing software host GoToWebinar. Do not contact us at CALI, we will not be able to provide technical support for the webconferencing software. Yeah, the test could provide a little more feedback. It does say “successful test” somewhere in there, though. We’ll send a note to Citrix who run GotoWebinar. I added a graphic to the post in hopes that explains the expected result. Good post, but you need to show an actual screen after connection. This is where my machine hangs. Maye show a 5 second test pattern.